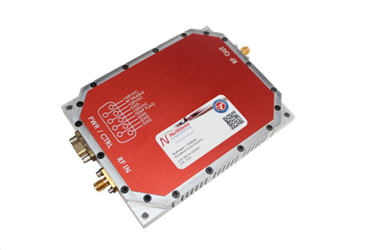 The NuPower L60T01 accepts a nominal 0 dBm (1 mW) RF input and provides 48 dB of gain from 960 MHz to 1390 MHz for continuous wave (CW) and near-constant-envelope waveforms. NuPower PAs feature over-voltage protection and can operate over a wide temperature range of -40 °C to +85 °C. NuPower PAs come standard with a Micro-D cable assembly with 18″ flying leads for interfacing to the unit. An accessory kit with a 28 VDC fan-cooled heat sink and an upgraded interface cable with banana plug terminations for lab testing is also available. For additional features and specifications on the NuPower™ L60T01 power amplifier, download the datasheet.